So, has any else noticed has fast the summer is going by? What is up?! Just. flying. by. However, as fast as it’s going by I’m okay with it because..wait for it…I’m starting to look forward to Fall. Yes, it’s true. Can you tell I’m from the West Coast?? 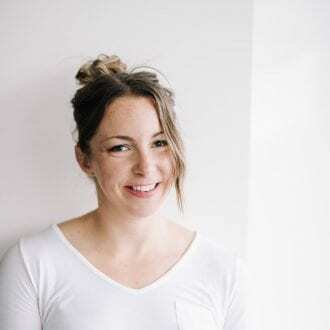 This is usually around the time I start to crave rain and pumpkin and cozy sweaters and running the SeaWall on chilly, Fall days, and dishes like Thai Red Curry Lentils. I know Fall is just around the corner here in Vancouver and although I plan to fully enjoy the last weeks of summer, I’ll be waiting to welcome crisp Fall days when they arrive. And more red curry lentils, of course! Healthy comfort food at it’s best. 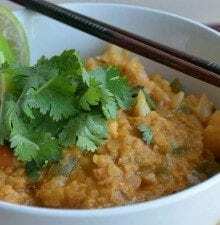 These red curry lentils definitely better suited to the upcoming season rather than summer, but if you love Thai food as much as me, these flavours are welcome any time of year. I love lentils and include them often in my weekly meal plans. I usually just make a big batch of red or green lentils on the weekend so I have them ready to throw into dishes all week. Lentils are very easy to cook. If you’re making plain lentils, simply place lentils in a saucepan, cover with water, bring to boil and then simmer, covered until cooked, which typically takes 30-35 minutes. You want them to be tender but not mushy, so be careful not to overcook them. These red curry lentils are very easy to make. You basically just add it all into a pot and let it simmer until the lentils are cooked. Cauliflower and carrot are added for extra nutrition, flavour and texture making this dish filling, satisfying, comforting and delicious. This recipe is high in plant-based protein, high in fibre and low in fat. My Coconut Red Lentil Dahl is one of my most popular recipes, but I think this new lentil recipe might give it a run for its money! Enjoy!! Add the onion, garlic and ginger and cook for 5 minutes, stirring often. Stir in the red curry paste and cook for two more minutes. Add the rest of the ingredients and simmer lightly, covered, for 23-30 minutes, stirring occasionally, until the vegetables and lentils and soft and tender. If it gets too thick as it’s cooking, add a little water as needed. Thank you for sharing this lovely recipe – carrots and cauli are two of my most favourite veggies. I was looking for something new to cook this weekend and this recipe fits the bill. Summer is flying by! It is scary! I’m pretty content with summer right now, but this looks great no matter what the season! Our family love lentils and this recipe looks delish…Im waiting for summer to be over so I can feel the holidays.too. Thank you. I know! I can’t believe it’s already mid August! What?! Thanksgiving is just around the corner!! omg. However, it’s still 100 degrees here in Texas so I’m looking forward to cooler weather. I LOVE Thai food (so jealous you’ll be going to Thailand soon), but I don’t think I’ve ever added lentils! Brilliant idea. Sorry jasmine rice..next time I shall try a new kid in town ;). Just made this tonight. I left out the sugar, as I’m trying to cut down on the stuff; I don’t think it needs it! This dish is so creamy and decedent. I had to add a lot more water to prevent it from becoming a solid – might be the altitude here or perhaps my coconut milk is thicker. Definitely a keeper! .. boo booo … all the forward about how to cook lentils … hmm .. I did that.. then added per recipe – no – I think you add uncooked! Yes, the recipe calls for “uncooked red lentils.” Sorry about that!